As a way of raising funds and promoting catechesis and Catholic evangelization, Aquinas Academy participates in the work of Lighthouse Catholic Media, a non-profit organization that provides excellent talks from dynamic Catholic speakers like Matthew Kelly, Scott Hahn, Father Robert Barron and others, through CD or download. 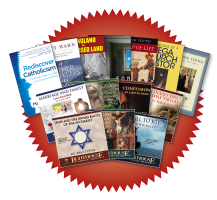 They also have books, booklets and pamphlets on many Catholic topics. These products are wonderful for personal spiritual growth, or to pass on to reach others. Visit www.lighthousecatholicmedia.org to find the online store, or click on "Subscriptions" to sign up to receive a CD each month in the mail through the CD of the Month Club, or a download directly to your inbox through the Download of the Month Club. Be sure to enter Aquinas Academy's promo code 101320 to support the school. Truth Be Told is an extraordinary opportunity to provide great Catholic speakers to youth and young adults. It is an excellent way to give a monthly dose of Catholicism tailored specifically to teach and inspire youth (not for young children). The Military Download of the Month Club provides nine months of free talks from Catholic speakers for military personnel and their families. Free lifetime membership for parents, spouses and children of those killed in action.